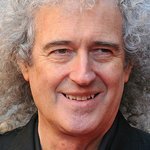 As the U.K. government announced the cancellation of Wednesday’s free vote to support fox hunting, Brian May – Queen guitarist and former PETA U.K. Person of the Year – joined representatives from his Save Me Trust, PETA U.K., the RSPCA, the League Against Cruel Sports, Born Free Foundation, Lush, and Humane Society International to celebrate at a rally outside Westminster. 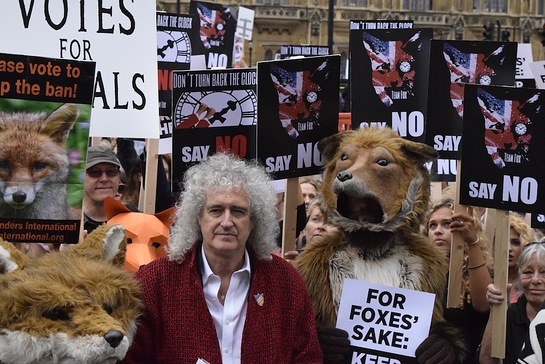 Those who gathered urged policymakers to continue to keep Britain humane by keeping the Hunting Act intact. The groups have pledged to fight any plans for a future vote that would amend the existing rules in England and Wales to increase the number of dogs allowed to flush out wild animals, which would, for all intents and purposes, make fox hunting legal again. The vote threatened to overturn a ban on hunting with more than two dogs — a decision that would doom countless animals to the terror of long, exhausting chases that typically end only when they’ve been torn apart. Claims that the vote was to bring England and Wales in line with Scotland are now defunct, given that members of the Scottish Parliament are calling on Holyrood to amend Scottish hunting legislation to limit hunting to two dogs. “We are appalled and shocked that the government would try to bring back fox hunting in 2015. It is turning the clock back on cruelty and against the will of 80 percent of the population,” says Save Me Trust CEO Anne Brummer.